THIS PAGE IS UNDER CONSTRUCTION: Please take note this is new material and is still being actively edited. Thank you. The First Detectors initiative works to stop the spread of forest pests through solid wood packaging containers by educating employees of distribution centers and warehouses. Shipping facilities are hubs where pallets and crates from all over the world gather in large quantities. These containers can harbor pests that have escaped treatment, or they can become infested after inspection. By educating employees who regularly work with wood containers that can transport harmful hitchhikers, we are able to engage a valuable group of detectors in a key setting. We aim to engage this group through two unique channels. First, outreach posters that inform people on what to look for, how to report anything unusual, and how to eliminate pests will be hung in distribution centers. Second, we are developing an e-learning course that will be offered to state-licensed pesticide applicators who work in these facilities to earn continuing education units required to maintain their licenses. These educational outreach materials are a synthesis of useful concepts that we identified in a review of existing materials produced by various agencies and governments. A short annotated list of some of the reviewed materials is located here as an archive. USDA Spotted Lanternfly Pest Alert: A two-page fact sheet with a few select images representing key life stages and basic information on background, distribution and spread, damage caused, identification, life cycle, where to look, and general reporting guidelines. Published by USDA APHIS, November 2014. Accessed December 2018. New York State SLF Fact Sheet: Two-page document with pictures of various life stages, info on ID, geographic location, history of infestation, threat posed, mechanisms of spread, signs of infestation, and what to do if you find them (ID, photograph, report). Includes state reporting link and state contact info. Informative and instructional. Published by New York State Dept. of Environmental Conservation, May 2018. Accessed December 2018. Penn State Extension Guide to SLF Management for Homeowners: Four-page document detailing the problem, ID of various life stages, 5-step guide to management (don’t spread, scrape eggs, band trees, remove trees, insecticide), discussion of table showing chemical control options, reporting info. Instructional. Authored by Heather Leach, David Biddinger, and Greg Krawczyk. Produced by Penn State Extension, Pennsylvania Dept.of Agriculture, and USDA in 2018. Accessed December 2018. Canadian Food Inspection Agency Asian Longhorned Beetle ID Card: Wallet-size card with life-size photos of adult, egg laying site, exit hole, and frass. Reads: “Report ALL sightings” and provides link to government website. ID tool. Published by Canadian Food Inspection Agency, 2015. Accessed December 2018. USDA Forest Service Asian Longhorned Beetle Pest Alert: Two-page document briefly describing the pest and its origin, preferred tree species, tree removal and chipping, life history, collection instructions, and general direction to contact state officials for reporting. Second page has pictures (mostly signs to look for on trees). Mix of informative and instructional. Published by USDA Forest Service Northeastern Area, 2008. Accessed December 2018. Canadian Food Inspection Agency Asian Longhorned Beetle Poster: A poster of captioned photos of signs and symptoms of ALB with a very brief description of adult insects, that they kill trees, a short list of ALB preferred species, pictures of insects easily confused with ALB, reporting hotline and link to more info. Instructional and functional. New York State Asian Longhorned Beetle Fact Sheet: Two-page document with pictures of various life stages, info on ID, geographic location, history of infestation, threat posed, mechanisms of spread, signs of infestation, and what to do if you find them (ID, photograph, report). Includes state reporting link and state contact info. Informative and instructional. Published by New York State Dept. of Environmental Conservation, October 2017. Accessed December 2018. Plant Health Australia Asian Gypsy Moth Fact Sheet: Two-page document with descriptions of AGM, images of different life stages, mechanisms of spread, a reporting hotline, and disclaimer waiving liability for actions taken (or not taken) based on information provided. Preemptive and informative. Published by Plant Health Australia. Accessed December 2018. New South Wales Asian Gypsy Moth Exotic Pest Alert: A more-technical document with descriptions of life stage, life cycle, host range, mechanisms of spread, associated damage, distribution, actions to minimize risk, and reporting info. Preemptive and informative. Published by New South Wales Government Dept. of Primary Industries, January 2017. Accessed December 2018. USDA Asian Gypsy Moth Pest Alert: A text document with three images that provides an overview of the threat, history of detection, description of life cycle, mechanisms of spread, links to learn more, and basic reporting guidelines. Mostly informative, somewhat instructional. Published by USDA APHIS, April 2016. Accessed December 2018. Washington State Lymantriid Invasion Fact Sheet: A document that lumps Gypsy Moths, giving broad descriptions of life stages, places to inspect, links to more information, and state-specific reporting hotline and website. General and instructive. Published by Washington State Recreation and Conservation Office’s Invasive Species Council, June 2016. Accessed December 2018. Emerald Ash Borer: The Green Menace: Text-dense brochure-style document with a few pictures and ample info on EAB background, signs and symptoms, role of humans in spread, quarantine areas, biology and behavior, susceptible species, prevention steps to take, and a list of state reporting hotlines. Informative, instructional, and functional. Published by USDA APHIS, June 2009. Accessed December 2018. Unwanted: Emerald Ash Borer: Visually fetching poster featuring a calendar-referenced illustration of the life cycle, pictures of ash trees, galleries, insects (both EAB and look-a-likes), and reporting info. Little to no background information or instruction; a streamlined identification tool with EAB-specific contact info. Published by USDA Forest Service and Michigan State University, 2004. Revised September 2009. Accessed December 2018. Emerald Ash Borer: How You Can Help: Tri-fold pamphlet with pictures and text giving steps to recognize host trees, identify signs of infestation, and actions to prevent spread and report. Includes links to more info and eight reporting phone numbers depending on state. Informative and instructive. Adapted and reprinted by Massachusetts Forest Pest Taskforce with permission from Sharon Bachman, Cornell Cooperative Extension New York Invasive Species Outreach Program and Western New York Emerald Ash Borer Taskforce. Accessed December 2018. Sea Container Cleanliness Bulletin: Text document that outlines the threat of transporting invasive species through global shipping lines; focusing on how this can negatively affect business as well as general things to look for during recommended self-inspection and links to more info. Consequential and instructive. Published by USDA APHIS and Canadian Food Inspection Agency. Accessed December 2018. IPPC Fact Sheet: Broad and general outreach document introducing invasive pests in a global context, highlighting the consequences they can have on trade and suggesting self-inspection measures to avoid their transport. General, consequential, and instructive. Published by International Plant Protection Convention, 2018. Accessed December 2018. Australian Government Pest Alert: Do You Have Stowaways on Board? : A document highlighting ten different types of insect pests to look for, each with a few images and very basic info on what to look for. Universal instructions on collection, destruction, and reporting given for all pests listed. Mostly informative. Published by Australian Government Dept. of Agriculture and Water Resources, 2016. Accessed December 2018. Original location: Do You Have Stowaways on Board? Archived version: Do You Have Stowaways on Board? Crate Invader Poster: Targeted at handlers of SWPC depicting wood and various pests, a brief description of signs to look for, and two reporting phone numbers. Instructive. Published by Illinois Department of Agriculture and USDA, 2014. 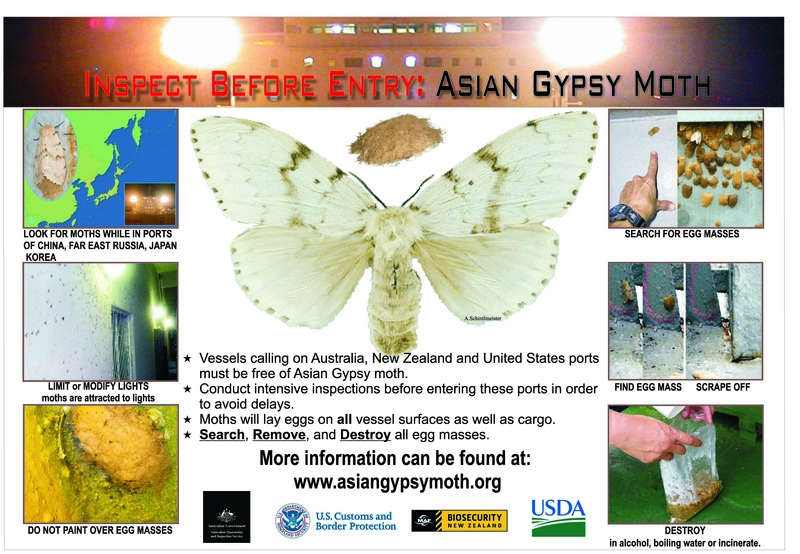 Inspect Before Entry: Asian Gypsy Moth: Poster to be displayed in vessels entering ports in Australia, New Zealand, or United States that gives instructions for finding, identifying, removing, and destroying AGM. Published by Australian Quarantine and Inspection Service, US Customs and Border Protection, New Zealand Ministry of Forestry and Agriculture, and USDA, 2012. Asian Gypsy Moth Pocket Card: Two-sided pocket-size card aimed at sailors with basic info on AGM, pictures, and reporting instructions. Published by US Customs and Border Protection.